VANCOUVER, BC / ACCESSWIRE / November 20, 2018 / 92 Resources Corp. (the "Company") (TSX-V: NTY) (OTCQB: RGDCF) (FSE: R9G2) is pleased to announce the acquisition of the Silver Sands Vanadium project (the "Project"), located in the Pine Pass area of eastern British Columbia. Adrian Lamoureux, CEO of 92 Resources, stated, "The vanadium spot price is currently nearing its all-time high since 2005 and has been on the steady climb gaining more than 550% since September 2016. The vanadium prices are expected to continue as the long term demand increases due to the commercialization of vanadium-redox flow batteries, we felt it appropriate to evaluate and acquire a high-quality vanadium project. The Silver Sands Vanadium project offers an opportunity to discover black shale hosted vanadium mineralization at a location with excellent access within a mining friendly jurisdiction." 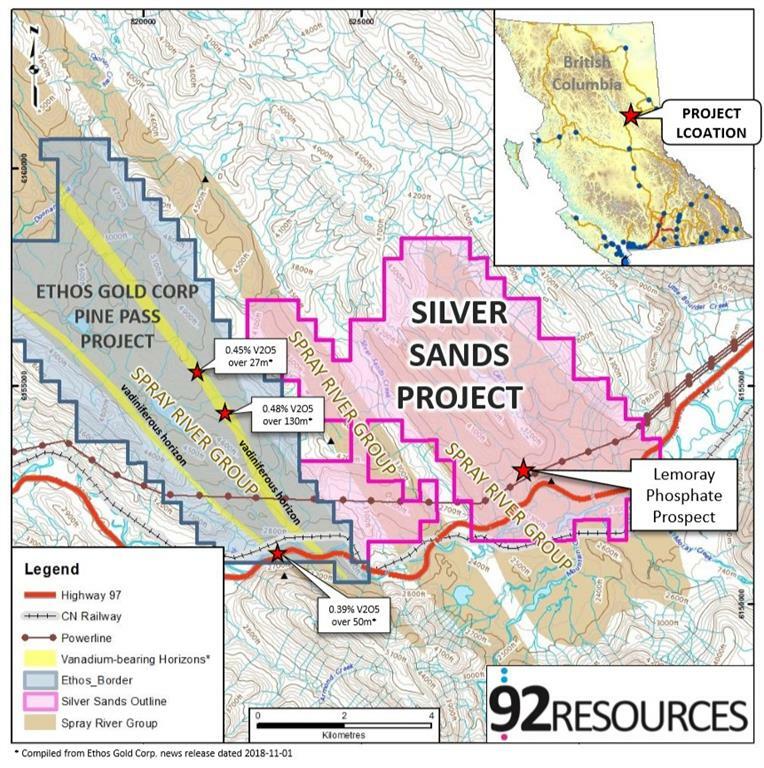 The Silver Sands Vanadium Project covers 3735 hectares directly east of the Pine Pass Vanadium Project held by Ethos Gold Corp., which is located about 200 km north of Prince George, British Columbia. The Silver Sands Vanadium project contains the same geological formations prospective for vanadium mineralization that is known within the region. The Project is within close proximity to the well-established infrastructure corridor of Pine Pass, which includes the Highway 97, Canadian National Railway and high-voltage powerlines and natural gas pipelines. At the Pine Pass Vanadium Property of Ethos Gold Corp. (Nov. 1, 2018 News Release) significant vanadium content of phosphatic black shales of the Toad Formation has been reported, including 0.48% V2O5 across 130 m width. The vanadium horizon has been documented to outcrop semi-continuously for over an approximate 20 km strike length. The relatively thick (stratigraphically) nature of this mineralization, and the long strike length (several kilometres) of the outcropping beds imply good potential for large tonnages. The rock types at the Silver Sands Vanadium Project are interpreted as an adjacent thrust sheet, of analogous or identical lithologies to those at the Pine Pass Vanadium Project. The Project contains regionally mapped early Triassic-aged Spray River Group rocks (containing the Toad River and Grayling Formations), which have been known to host vanadium-bearing horizons associated with phosphatic shales. Specifically, the project is host to the Lemoray phosphate prospect, a phosphatic horizon which has been historically noted in the academic literature, but it’s relation to vanadium mineralization has not yet been tested. Following the acquisition of the Project, President & CEO Adrian Lamoureux stated, "Acquiring the Silver Sands Vanadium Project is aligned with 92 Resources strategic corporate plan. With a focus on future energy metals such as lithium and frac sand, we have now positioned the company with a key vanadium asset in a mine friendly jurisdiction. We will now evaluate and put together our winter exploration plans that should contain our Phase 1 drill program at the Corvette-FCI lithium project in Quebec. We were recently successful in brokering an option agreement with Osisko Mining to expand the project to over 10,000 hectares and have already evaluated and defined some key areas that warrant diamond drilling as sampling programs returned high-grade lithium spodumene-bearing pegmatites." Pursuant to the agreement, the Company shall acquire a 100% interest in the Project by paying staking costs of $15,000. The vendor shall retain a 2% Net Smelter Return on the Property. 92 Resources Corp is a modern energy solution company, focused on acquiring and advancing strategic and prospective modern energy related projects. The Company currently holds four principal assets in Canada: the Corvette and Pontax lithium properties in Quebec, the Golden Frac Sand Property, BC, and the Hidden Lake Lithium Property, NWT, currently under option to Far Resources Ltd.
Management cautions that past results or discoveries on adjacent properties may not necessarily be indicative to the presence of mineralization on the Company’s properties. Neil McCallum, B.Sc., P. Geol., of Dahrouge Geological Consulting Ltd., a Qualified Person as defined by National Instrument 43-101, supervised the preparation of the technical information in this news release. Statements included in this announcement, including statements concerning our plans, intentions and expectations, which are not historical in nature are intended to be, and are hereby identified as, "forward-looking statements". Forward-looking statements may be identified by words including "anticipates", "believes", "intends", "estimates", "expects" and similar expressions. The Company cautions readers that forward-looking statements, including without limitation those relating to the Company’s future operations and business prospects, are subject to certain risks and uncertainties that could cause actual results to differ materially from those indicated in the forward-looking statements.